As the winter really starts to bite, so do the cod. They are brought inshore after the winter storms to feed on the glut of food churned up by the rough seas, so this is the time to get yourself a tasty supper. 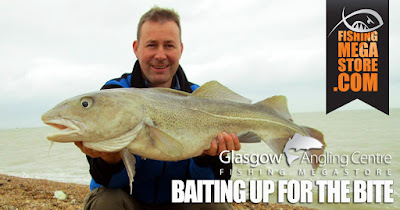 The Cod season on the East Coast of Scotland has got off to a bit of a slow start, but the hardy breed of cod fishing specialists are still able to root out a few cod from the rock gullies. So how do you get into this elite band of fishermen who head out in the worst of the weather and return home with ultimate prize catch? Successful cod fishing (like most fishing) is almost always down the to above motto. 1. Timing You need to be prepared to fish when the cod are there, and feeding. If fishing in your shorts and t-shirt is not the game for you, the best time is after a big blow. In the depths of winter, on a lot of marks, you need to fish through the night and at the right state of tide to give yourself the best chance. An old fashioned tide table like the QT International Quick Tide Chart is as good as the internet, and more portable. 2. Location This may be the most difficult thing to master. There are lots of well known cod marks out there, but most will be very busy with other anglers at the best times - other anglers can be very 'cagey' about giving up their secret marks. But all is not lost. A bit of knowledge of the rough areas, and the wealth of online resources such as Google Maps and Avionics, combined with at lot of footwork, should get you where you need to be. 3. Gear You have arrived at the right place at the right time, so now you will need the correct gear. Firstly, you are going to need a good stiff, rough ground rod to bully the cod through the heavy kelp that fills the gullies that they love to feed in. Something like the Century Eliminator T900 teamed up with a good quality multiplier reel such as the Penn Fathom 25 star drag or Daiwa Saltist Black Gold is ideal for the job. Make sure you fill the reel with a good mono line around the 18-30lb mark and you are good to go. 4. Bait This is the most important part of the whole operation. You can get everything else right but if the fish don't want to eat what you have on offer, you will go home empty handed. Cod fishing means big smelly baits. Black lug, Pealer crab and Squid are probably the most common, but depending where you are, Bluey, Rag, or Mackerel may be the preference. Most sea anglers will use a combination of some of these baits and make a cocktail bait. Bait presentation is also important, especially if you are using big cocktail baits, because it makes casting with them a lot easier. This has been recently aided by the Gemini Spring Loader bait tool. Hopefully these 4 tips will help put you on the cod this winter. However, one of the most important pieces of advice is to be careful out there and making sure you know the ground you are on and what the dangers are! Also take your mobile phone and let someone know where you are going and when you expect to be back. Lastly, wear some type of floatation device like the Spinlock Deckvest Lite Auto Life Jacket or a Floatation suit like the Fisheagle Expert 2pc Flotation Suit.